No matter the season, none of us enjoy having dry or rough skin. 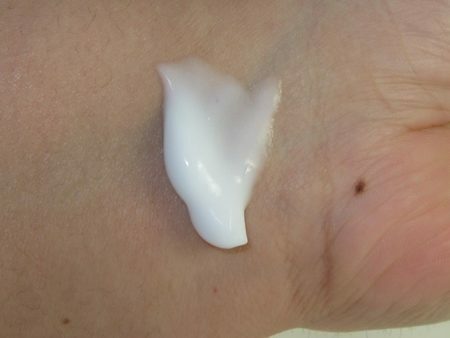 Sure, many of us try various lotions and balms, but many of the results disappear shortly after application. For those times when the traditional lotion just isn’t working, try something else. Try an in shower lotion. What is that, exactly? You’re about to find out! However, not just any old product will do. We have all of the best in shower lotions right here for you to enjoy. What are you waiting for? Soft, supple skin is calling your name! Now that you’ve taken a quick overview of each of the best shower body lotions, you’re probably interested in learning more about some of them. For detailed, in-depth, and unbiased reviews, scroll down a bit further! 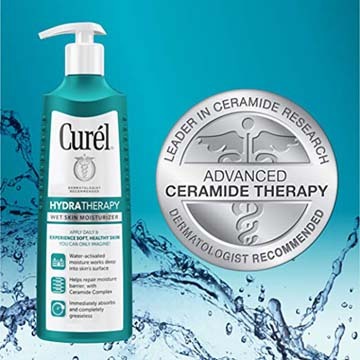 Probably the most raved-about in shower lotion, is the Curel Hydra Therapy Wet Skin Moisturizer. Sure, it’s a mouthful, but the product not only lived up to our very high expectations – it exceeded them! 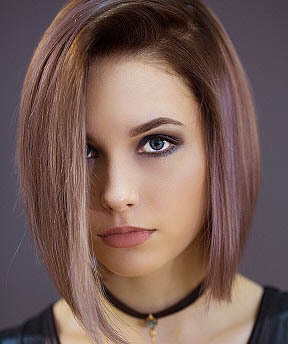 The product is very unique, and due to the fact we felt that no other could really compare, it ended up being our Editor’s Pick! Activated by water right after you get out of the shower, it penetrates deep into the skin to get rid of dryness, and to help keep skin soft and healthy. It also features a very special Advanced Ceramide Complex. It works to bring moisture to all of the spots on your skin that are craving it. Ceramides are naturally-occurring and are found in healthy skin. They’re essentially the foundation and what makes up the skin’s moisture barrier. Once we become low in ceramides, we begin to see dryness and cracking of the skin. They’ve been shown to help give the skin a more youthful look and prevent visible signs of aging. In addition to the ceramide complex, there are other helpful ingredients, such as Shea Butter, Pro-Vitamin B5, and Eucalyptus Leaf Extract. All of these ingredients combined, work to sooth, hydrate, and repair the skin to make sure it’s consistently moisturized and healthy, from the first application, on. As with pretty much everything we put on our skin, we like to know what it feels like! This after bath body lotion is also non-greasy, so you don’t have that residue feeling after you’ve just washed your body. If anything, you’ll feel even more fresh and renewed! There is also no added fragrance, so there are no increased chances of adverse reactions or irritation. Clearly, we had a great experience if it made our editor’s pick! Firstly, we loved the fact that it’s dermatologist-recommended, and honestly wonderful for any type of skin. 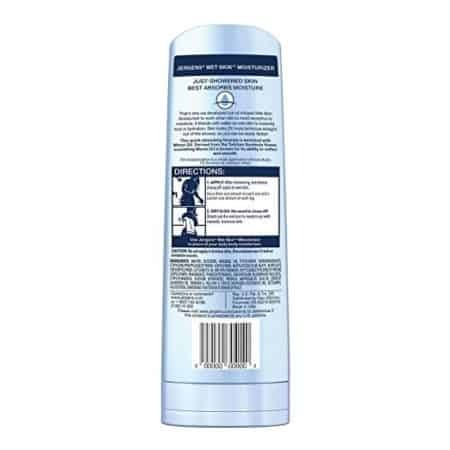 Even if you have very sensitive or delicate skin, you’ll love this best in shower body lotion. It’s so wonderful for repairing dry and damaged skin, in fact, that it even received the National Eczema Association Seal of Acceptance. As you can see from the image above, it’s super easy to use, and doesn’t take up too much time or effort. Looking for something for your date tonight but don’t have time to wait around for results? That’s okay! This product works really fast. So fast, in fact, that you can feel the hydration immediately, as the pores are more open to receiving the hydration and reparation your skin is craving. We’ve tried a wide variety in shower moisturizers, but most were less-than pleasant. They were greasy or had some kind of residue left afterward. This one is completely grease-free. All you have to do is glide it on, then wipe off any excess that remains. It absorbs very quickly, so you don’t need to hang out in the bathroom all day waiting for it to dry. The brand claims that your skin will feel three times more hydrated, and while that’s rather difficult to measure, we can say that our skin felt notably softer and smoother. Just when you thought you’d seen it all, St. Tropez comes out with their Gradual Tan In Shower Lotion! If you’re looking to hydrate, soften, and tan but don’t have the time or don’t want to spend the time doing all three individually, look no further. This in shower lotion works to hydrate, soften, and tan in just one go! The easy-to-use lotion leaves you with a golden glow which gradually grows deeper as it builds. With each use, you’ll grow more sun-kissed (without the harm of UV rays, of course!). Simply apply the ultra-hydrating lotion in the shower. At first, it will start creating a luxurious lather which actually feels like you’re at the spa! The lather is essential in letting you know where the tan is, so you’re not left with any areas that aren’t covered. If you’re looking for a dramatic difference in just one application, you’d probably be better off using a different product. However, if you’re patient and want to spend the time, then apply this for three consecutive days and you’ll see a payoff that’s definitely worth waiting for! 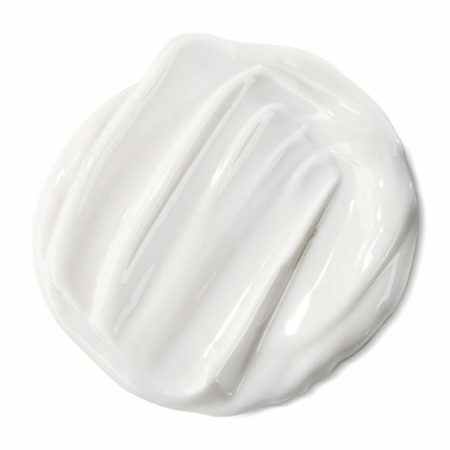 After applying with circular motions to achieve even coverage, washing hands, and then fully rinsing off with warm water, dry your skin, and you’re all set. As you go about your day, the tan will develop. You also don’t have to worry about any streaks or spots, as the product actually works really well to give you an even, natural-looking tan. The product is free of parabens, sulfates, phthalates, and has 100% naturally-derived DHA, so you don’t have to worry about putting potentially harmful chemicals onto your skin! With the inclusion of Sweet Almond Oil, you’ll also reap the benefits of super soft, supple skin! So, what are the downsides? Actually, there’s only one for us, which is the price. It is quite expensive, however, it is a kind of two-in-one, so you don’t have to buy a separate self-tanner! 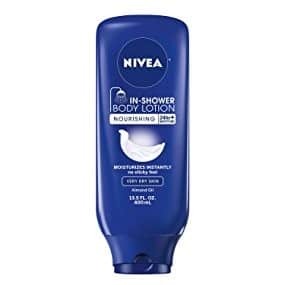 If you’ve ever used a Nivea body lotion before, then you know how good it works for an affordable price. The German company consistently produces high-quality body lotions that really stand out, even among more expensive products on the market to compete with. With that being said, we had to try the Nivea In-Shower Nourishing Body Lotion. Many have claimed that this is one of the best in shower body lotions out there, and has revolutionized how we think about moisturizing our skin. The formula moisturizes instantly with no sticky/greasy feeling, and leaves skin feeling soft, smooth, and moisturized for 24 hours or more! Worried about it not working with your skin type? It works well with all skin types – from dry to oily. It works well at regulating oil production, while making sure skin stays soft and healthy. First off, we enjoyed the extra time in the morning that we saved from using this moisturizer, as you don’t have to use various products or go through multiple steps to achieve the same results. In addition, you don’t have to fret with that sticky residue that many body creams, butters, and lotions leave afterward. So, how does this in shower lotion feel? It’s thick and creamy, but we wouldn’t necessarily describe it as “luxurious”, like some of the competitor products are. To apply, simply rub in all over any part of your skin that craves moisture. After that’s done, simply go ahead and rinse it off. You’ll start to notice a difference in the feeling of your skin immediately after the initial application, however, you’ll probably also notice a thin film on the places you applied the lotion. Make sure you rub your towel over those places to let it absorb and get rid of any excess. Your skin will be left feeling super-hydrated, soft, and smooth with daily use. The one notable downside, was that with others, you only have to use it once or twice a week to see great results. With this one, we had to use it more frequently to get similar results. However, this Nivea body lotion is much more inexpensive than comparable products. 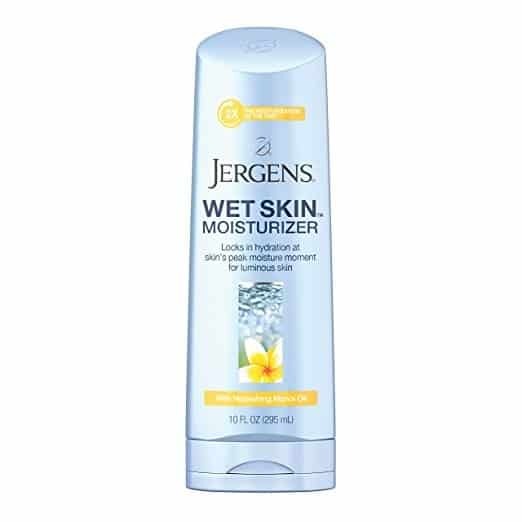 The Jergens Wet Skin Moisturizer comes in some different options, so if you’re seeing different graphics and colors with the same name on the bottle, that’s why. The options are: Restoring Argan Oil, Refreshing Coconut Oil, Original with Original Cherry Almond Essence, Nourishing Monoi Oil, and Calming Tea Tree Oil. The oil-infused body lotion is for use post-shower; when your skin is still damp and more receptive to moisture, as the pores are open. Something really cool about the Jergens in shower lotion, was that you don’t have to wait around for it to dry before putting your clothes on like you would with so many other products. It sounds kind of odd, but trust us! Jergens is easily one of the most well-recognized household names when it comes to skin products. In fact, it was even the winner of Allure Magazine’s Best of Beauty Breakthrough Award back in 2015. Jergens is a household name for many, which automatically helps gain the trust of many consumers. They’re a brand known to produce consistently reliable products that don’t really aim to create revolutionary products, but rather improve a bit upon more affordable products. With that being said, we felt that it lived up to our relatively-average expectations we had before using it for the first time. It was good, but it definitely isn’t reinventing the wheel. In fact, the main reason we even put it on our list, was because it was very inexpensive for how good of a product it was. The lotion isn’t as thick as some of the others, which isn’t necessarily a bad thing. Some women prefer a more luxurious, almost body butter-type product, but as that’s not a rule, we didn’t give it much thought. It applies quickly and easily, and we noticed that it was one of the quickest to absorb into the skin. It blends well with the water on your skin, and works to keep the hydration where it needs to be, so you don’t have to keep reapplying all day. It really takes time off of what you’d probably spend performing your daily routine, and all you have to do is pat-dry with a towel, put your clothes on, and you’re on your way! It’s not like your typical lotions where it’s a hassle to pull on your leggings due to the moisture still on your body. The smell differs, depending on the formula you choose, however, they all smell very natural and fresh. The thing we didn’t like? That it didn’t hydrate quite as “deeply”, as most others out there. 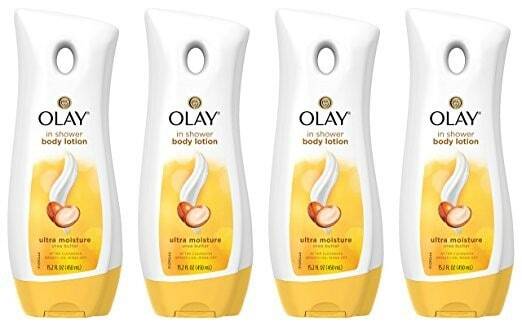 The Olay In Shower Body Lotion is definitely one of the most well-known shower body lotions on the market today. This lotion works with the heat and humidity of the shower, to improve hydration in less than a week. It works well for super-dry/flaky skin, and can be used all over the body. Formulated with Shea Butter, it makes the skin super soft upon first use. 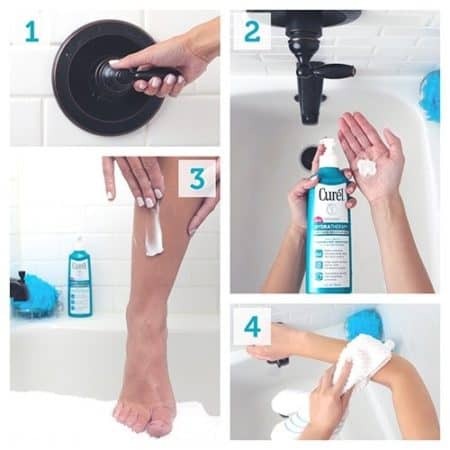 It works right away, and absorbs into the skin effectively. It’s not thick like some others, but it still hydrates well. Also, it’s the best budget product, hands-down. If you’re shopping on a budget, we really feel that the Olay in shower lotion really can’t be beat. While it is quite a bit of product, coming in at a four-pack, trust us when we say that you’ll be happy with the results! It hydrates quickly and absorbs easily. The scent is very nutty and smells great, however, isn’t overpowering like so many other lotions. Due to how well it hydrates with just one application, the product will last you for quite a while. So long, in fact, that you may feel inclined to gift one or two of the bottles to friends or family! The one thing we didn’t like? Remember how we mentioned you only need a little bit of product for deep moisture? Well, think of that as also a restriction. If you use too much product (think, more than a dime-sized amount) you may find yourself with pretty greasy skin! Now that you’ve taken a look at all of the best shower body lotions, have you figured out which of them are the best for your needs? 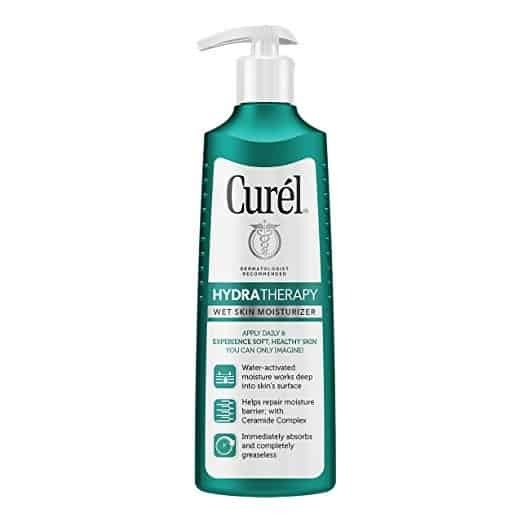 If you’re still undecided, we can’t recommend enough the Curel Therapy Moisturizer. It’s great for all skin types, is fragrance-free, and not only hydrates skin up to three times, it helps to increase ceramides, which are the building blocks of the moisture barrier in the skin. So, which one of these best in shower lotions will be making their way into your bathroom? Rosalind graduated with a Bachelor’s degree in Communication and Media from the Erasmus University Rotterdam and now lives and works as a freelance writer in Utah.